Leghorn Vinyl Wristbands are great for crowd management and security as well as for any application where a visual mean of identification is needed. Leghorn Vinyl wristbands, with their premium quality vinyl, are comfortable and durable for extended wear. The non reusable locking plastic snaps discourages transfer and increases security. 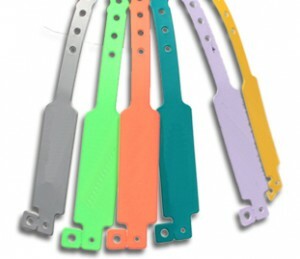 • Our wrist bands come in a wide array of different colors and patterns. Call us for for further details. 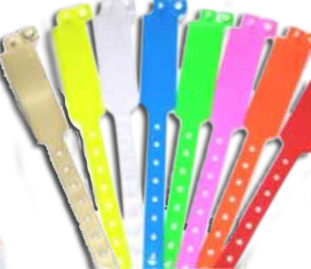 •Vinyl wristbands are waterproof, more durable and secure than Tyvek® wristbands. Ideal for multi-day use and/or rugged wear. • They feature a permanent locking plastic snap to prevent transfer. Solid colour vinyl wristbands make it easy to visually identify your patrons. • A logo/message can be printed on request (at extra cost).All imprints are printed in black in the imprint area shown on the wristband example. • Lead time is 10-12 working days from date of artwork approval.